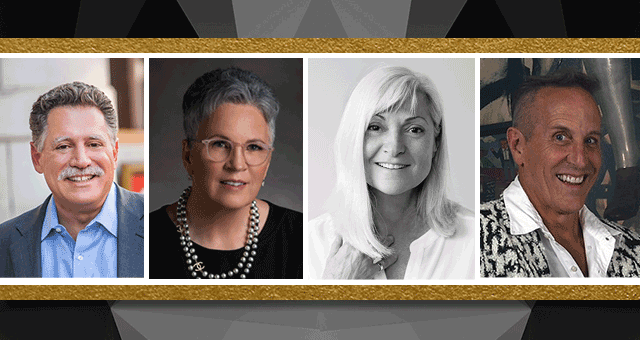 Four distinguished industry professionals will be inducted into Hospitality Design’s Platinum Circle hall of fame Tuesday, November 14th at a gala celebration at the Ziegfeld Ballroom in New York City. The honor is bestowed on those who have dedicated their careers to contributing to enhancing design, architecture, ownership/management, purchasing, and other disciplines in the hospitality industry. After a long and striking career with Ian Schrager properties, including the Royalton Delano and the Hudson, Andrei has recently embarked on the creation of her own studio, with such current projects as the Asbury Hotel in New Jersey and 11 Howard in New York. For nearly 30 years, Bensley has been known for his lush landscape architecture and for designing luxurious, eco-sensitive hotels and resorts—more than 200 projects in 30-plus countries. Among them are the InterContinental Danang in Vietnam; the Royal Istana in Malaysia; Kittitian Hill in St. Kitts; and the Four Seasons Resort Hualalai in Hawaii. The procurement firm was founded by Cardy in 1999 and has since expanded to include coveted clientele serving such brands as W, Mandarin Oriental, Westin, Baccarat, St. Regis, 1 Hotels, Element, Auberge Resorts, and more. Isenberg founded Sage in 1984, which now has an impressive portfolio of hotels under its management arm, including such brands as Marriott, Hilton, Hyatt and Starwood, as well as ownership of hotels including the Halcyon in Cherry Creek, Colorado; the Maven Hotel in Denver; the Crawford Hotel at Denver Union Station; the Logan in Philadelphia; and the Darcy in Washington, DC. In 2006, Sage established a restaurant arm, which now operates 10 restaurants.